Would You Turn Down $77 Billion? 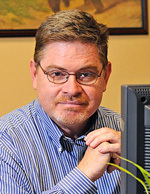 My friend and colleague Sean Brodrick has hit one winner after another in an unusual resource opportunity. It's not one that the Wall Street fatcats have wised up to, yet. But alert investors who are ahead of the pack — and followed Sean's lead — racked up gains of 300% ... 400% ... 500% and more on their investments. Sean says the next buying opportunity may be coming soon. And he explains some reasons why in this article right here. I hope you find it as intriguing as I did. Here’s a quick question for you. Would you turn down $77 billion? … hidden under a big ol’ pile of marijuana, that is. Then buddy, I’ll take your share of the $77 billion! 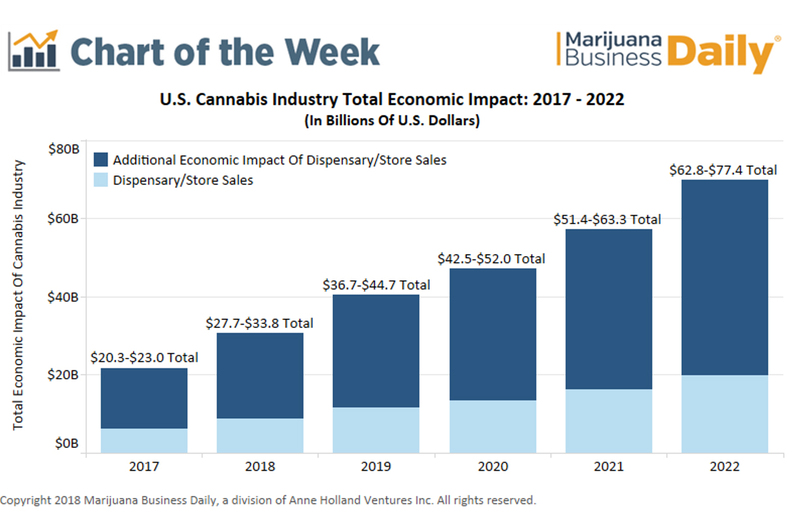 It shows the total economic impact of legal marijuana sales increasing from $20 billion-$23 billion in 2017 to $63 billion-$77 billion by 2022. That's a 223% increase. I don’t think states will turn this money down. They need jobs. They need tax revenue. Heck, they need pot! And that $77 billion is a conservative estimate. Another report, from New Frontier Data, estimates the cannabis industry could generate $131.8 billion in federal tax revenue alone and add 1.1 million jobs by 2025 if it's legalized for adult use in all 50 states. But let’s stick with the conservative, $77 billion figure. That’s more than the total state tax revenue brought in by 38 states. This includes some big states. Michigan, Washington, Missouri and more all bring in less than $80 billion in state taxes every year. Sure, that $80 billion won’t just be in the form of tax revenue. This figure includes the economic impact of new businesses opening up. Thousands of new jobs will be created. Ancillary businesses, too. Those are companies that aren’t directly involved in cannabis, but make money from it anyway. 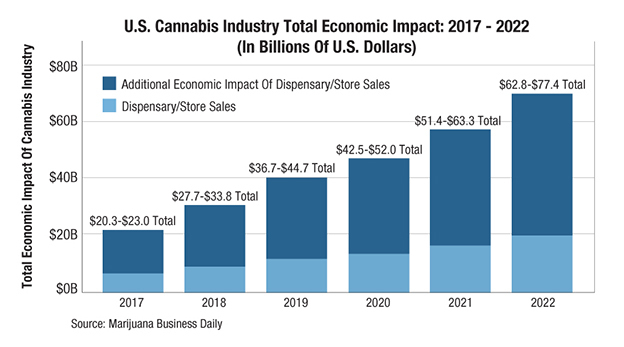 The report estimates that for every $1 consumers or patients spend at dispensaries and rec stores, an additional $2.50 of economic value will be injected into the economy. It’s almost as if the Drug War was a silly, self-defeating policy designed to prop up the U.S. prison industry. But I digress. Canada already has legal medical marijuana on a federal level. And on Oct. 17, recreational marijuana becomes legal from the chilly coastal sunrises of Newfoundland in the East to the gorgeous ocean sunsets of Prince Rupert in the West. CIBC, one of Canada’s largest banks, predicts that country’s legal marijuana industry will reach $6.5 billion by 2020. Per the latest report from Deloitte, Canada's cannabis market will exceed $7 billion by 2019 and legal sales will make up more than half of that. Throw in all the ancillary businesses, and it will be triple that — or more. In the U.S., even though most marijuana is illegal, the market was worth $9.2 billion last year. That's up from $6.6 billion in 2016. Over the next decade, it should hit $47.3 billion. That’s according to a report from Arcview Market Research. In the shorter term, tiny Vermont legalized recreational marijuana on July 1. Michigan and New Jersey should legalize recreational marijuana this year. Rhode Island and Connecticut aren’t far behind. Illinois is ready to jump on the bandwagon, too. 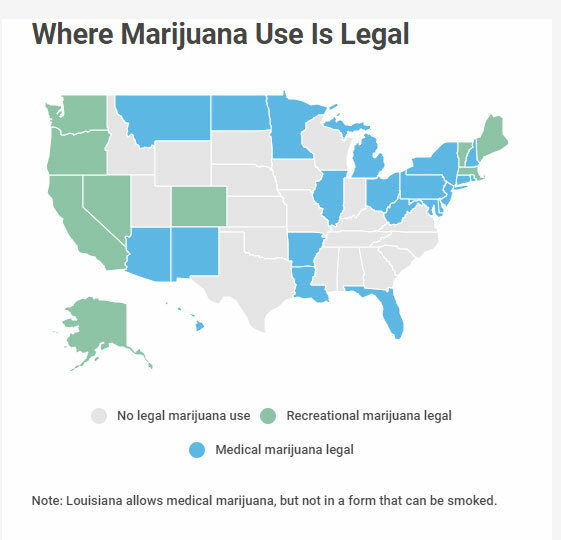 So far, 28 states have legalized medical or recreational marijuana, or both. The tide is definitely turning. The U.S. hasn’t legalized on a federal level … yet. But you know it’s coming. Meanwhile, in Europe, Germany is poised to lead the rest of the Eurozone into the cannabis markets. Can you imagine those uptight Germans charging into pot? I bet the rest of Europe will hurry to play catch-up. You can research and buy individual stocks. That’s what I’ve done for my subscribers in the past. And I plan to do a lot more of it in the future. Or, you can buy the ETFMG Alternative Harvest ETF (NYSE: MJ) tracks a nice basket of cannabis-related stocks. It has an expense ratio of 0.79%. MJ holds a bunch of stocks on both sides of the Canadian border. Some 52% of its holdings are in Canada, 36% in the U.S. and the rest from around the world. So, MJ gives you exposure to stocks that will profit from Canada’s legalization … and it holds plenty of stocks that will rocket higher when and if the U.S. legalizes on a federal level. The Green Tide … a tidal wave of profits … is coming. Get ready, my friends. You want to be onboard when this wave hits. P.S. Gene Simmons — yes, that one, of KISS fame — will be at next month's San Francisco MoneyShow. He'll be talking about cannabis and his role as chief evangelist officer for British Columbia-based Invictus MD, which produces medical cannabis, fertilizers, hydroponic-growing supplies and other technology. The stock trades on the Toronto Venture Exchange as, get this, GENE. I'll be at the show, too, talking about energy metals. Come out, listen in and say hello if you can. Click here to secure your FREE spot today.